Former NASA physicist and astronaut Ed Lu and astronauts Tom Jones and Bill Anders released information showing that since 2001, there have been 26 known explosions on earth as a direct result of asteroids. This is upwards of 10 times more strikes than previously thought. They state it has been “blind luck” that a populated area of the earth has not been hit by an asteroid causing major destruction and death. 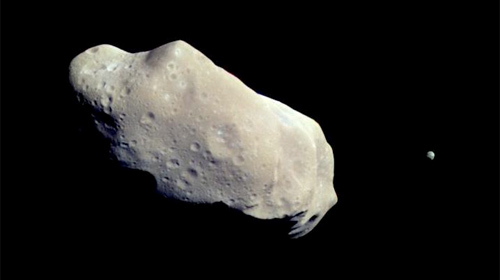 Asteroids are called mini-planets with some big enough to have their own moons. The group detected the massive explosions associated with asteroids using data from a nuclear weapons testing network operated by the Nuclear -Test-Ban Treaty Organization. Most of the asteroids exploded in the atmosphere, while those that made ground either hit uninhabited land areas or the oceans. The impact of these asteroids is the equivalent of a nuclear bomb. Many were stronger than the 1945 Hiroshima nuclear blast and one asteroid was 20 to 30 times more powerful. The asteroids ranked between 1 to 600 kiloton explosions. In comparison, the Hiroshima bomb was 15 kilotons. The Hiroshima nuclear blast killed an estimated 90,000 people and flattened the city extending 4.7 square kilometers. ‘This network has detected 26 multi-kiloton explosions since 2001, all of which are due to asteroid impacts. ‘It shows that asteroid impacts are NOT rare—but actually three to 10 times more common than we previously thought. The three released their report on April 22, 2014 at Seattle’s Museum of Flight. They are part of B612 Sentinel Mission set up to find and track asteroids that could potentially hit the earth. They hope to send up a satellite in 2018 to specifically track asteroids. Though there was no major asteroid impact between 2001 and 2013, there have been close calls. On February 15, 2013, an asteroid crossed the Russian province of Chelyabinsk exploding high in the atmosphere. Over 1,000 people were injured by shards of glass from shattered windows caused by the resulting shock waves which reportedly circled the earth twice. It is believed that asteroid was just 19-metres wide and weighed about 100,000 tonnes, but its explosion was 20 to 30 times more powerful than Hiroshima. The Chelyabinsk asteroid was a complete surprise, in fact, the very same day it hit, astronomers were actually tracking another asteroid named “2012 DA14,” instead. Tracking asteroids is not as simple as it seems. If they are darker in color and a bit smaller in size they are hard to detect with a telescope. If they are coming in towards earth directly lined up with the sun — as the Chelyabinsk asteroid did — they are impossible to see. After Chelyabinsk, the US government held hearings on the threat of asteroids and meteors. The following is a brief interaction between Florida Representative Bill Posey and General Charles Bolden (retired) now with NASA. Posey: “You know what would we do, if you detected even a small one [asteroid], like the one that detonated in Russia headed for New York City in three weeks. What would we do? But curiously the B612’s report has information that may directly relate to two key Biblical passages speaking of the end times. Joel 2:30-31 and Revelation 6:12-13 reference a solar event called Blood moons in relation to end time events. In a previous article, I talked about blood moons and how we are entering an unusual phase that will feature four blood moons over the next two years, with the first having already occurred April 15th. The Apostle John who wrote Revelation further explains that a blood moon will be one of the signs of the opening of apocalyptic sixth seal — a clear indicator the earth has entered the end times. Joel says there will be massive destruction on the earth marked by blood, fire and columns of smoke. This description suggests many people will be killed. In his end-time vision recorded in the Book of Revelation, John doesn’t mention destruction but adds there will be two more signs — stars falling from the sky and a great earthquake. When the Apostle John described the falling stars he used the analogy of a fig tree to describe the event. When shaken by the wind, its unripe figs are torn from the branches and splatter the ground. The analogy signified the earth would similarly receive multiple hits by falling stars. Is this a reference to asteroids or meteors? Though Joel doesn’t mention these two events, Joel does talk about “wonders in the sky and on the earth” and these could be vague references to the falling stars and an earthquake. His description of great fires and destruction may simply be describing the aftermath of stars (asteroids) hitting the earth and a massive earthquake. If so, Joel may be looking ahead to the opening of the sixth seal. Jesus also may have referred to asteroids when he talked about “terrors” from the heavens in the end times in Luke 21:11. Jesus says “And there will be great earthquakes, and in various places plagues and famines; and there will be terrors and great signs from the heaven” (NASV). Multiple asteroids hitting the earth causing great destruction would cause terror. You can’t escape them. You can’t even see them coming. Blind luck or Divine timing? The B612 group calls it ‘blind luck’ that an asteroid hasn’t hit a populated area of earth. However, if the Apostle John and Prophet Joel are right, at some point, that may change. The earth will be hit by asteroids or meteors that will inflict significant damage and if Joel is right about the blood, many will die. It will be one of the signs, we have entered the end times. Next PostRevelation 6:12: The Great U.S. Earthquake?